Ali knows his neighborhood in Brooklyn has a bad rap, but he likes to stay above the fray. He's a kid who looks after his mom and his sister, and avoids the guns, drugs, and gangs that sometimes plague Bed Stuy. One day, two boys Ali's age move in next door, and they immediately strike up a friendship. Noodles and Needles are brothers and Needles has Tourette's. Needles frequently has tics and shouts out inappropriate words, but Ali's mom has discovered a way to help calm his tics: knitting (thus his nickname). Despite the fact that Needles' condition seems to bother no one in their neighborhood, Noodles clearly harbors a great deal of resentment towards his brother that eventually comes to a boiling point when Needles takes a hit for something that was Noodles' fault. "Let's pretend this punching bag is your father. What do you want to do to him?" He slowly released my fist. My nails were digging so deep into my palm that I thought I had broken the skin. "Show me," he said again, this time nudging my shoulder. I turned toward the punching bag, opened my fist, and wrapped my arms around it. Malloy sat there in his chair staring at six-year-old me, hugging a punching bag like it was a person. 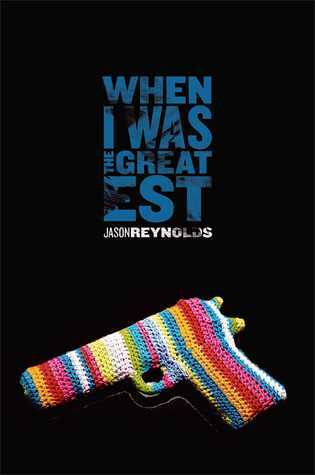 With writing like that, Jason Reynolds has staked his claim as a force to be reckoned with in the world of young adult literature. The future is bright for this young writer and I can't wait to see what great things are in his future. I wouldn't be surprised in the slightest if he has a Coretta Scott King Award and maybe even a Schneider Family Book Award grace the cover of this book in early February.